I’m standing on the top of a great rocky outcrop overlooking the ocean, my eyes intently scanning the water. Below me and to my right, the pristine creamy sand of Whites Beach sprawls for miles, out from which surfers paddle into cerulean blue water. Behind me is a secret path through rain forest whence I’ve just come, clambering down stone and hanging onto coastal trees for support, a tangle of vines and ferns and wildflowers. In front of me is nothing but sapphire blue ocean. It’s a windy day, and the white chop of the surf makes it hard to spot what I seek. I gasp with excitement. The surfers straddling their boards, tiny from this far up, point too, transfixed, close enough to be awestruck by its presence. The great tail of a humpback whale thrusts up from the water in a tail throw, waving for a few short seconds above the surface before it descends with a big splash. It’s so close. I can see the great shadow of it move northward, just barely beneath the surface of the ocean, moving fast. We hurry down from the pinnacle of the headland onto the grassy hill, venturing further east, hoping to catch another glimpse of the whale as it swims past. The dark shadow beneath the water moves toward us. I have my doubts that it’s the same thing we have just seen. Is it a school of fish this time, or is it...? The water is so clear blue that I can see the flippers of the whale as it rises to kiss the surface. The gloss of the sun’s reflection on its smooth rubbery dark skin glistens as it emerges. It is so close to the headland I can hear the great roar of its exhalation as it expels another flume of mist from its blowhole into the air. In little more than a second it is descending again, lower and lower, until even its shadow disappears from view. This was not the first whale I’ve ever seen and nor do I think it will be my last. Whales are my favorite animals. But up until relatively recently, I had not seen one in person, despite many attempts. I had even been on a whale watching tour – but was so riddled with seasickness I kind of missed it. So what does one do when one loves whales and one, perhaps like me, is not a boat person or cannot afford a tour? 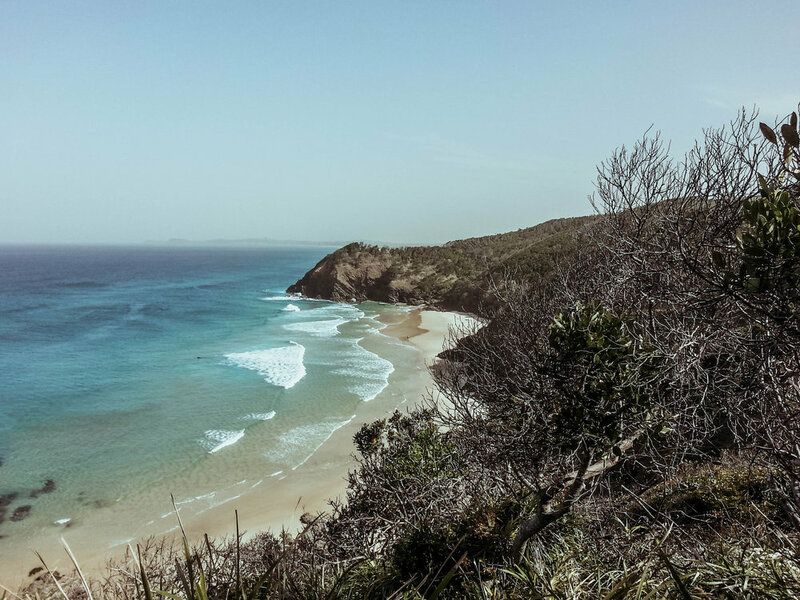 Head to Byron Bay, the place where the whales are. Byron Bay is a medium sized coastal town in northern New South Wales, Australia. It is about 50 minutes, give or take, from Gold Coast International Airport, or 2.25 hours from the Brisbane CBD. Whilst the town itself has just 5,000 permanent residents, it welcomes up to 1.5 million tourists a year, making it a very popular tourist destination. Its pristine beaches and national parkland, good surf, growing nightlife, earthy and hipster/new age vibe are major draw cards for tourists... and, of course, its reputation for being a whale watching hot spot. 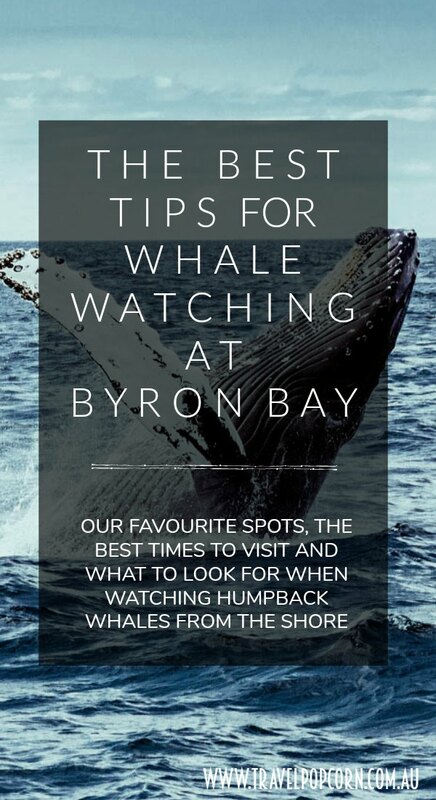 So, why is Byron Bay such a fantastic place to watch the whales? 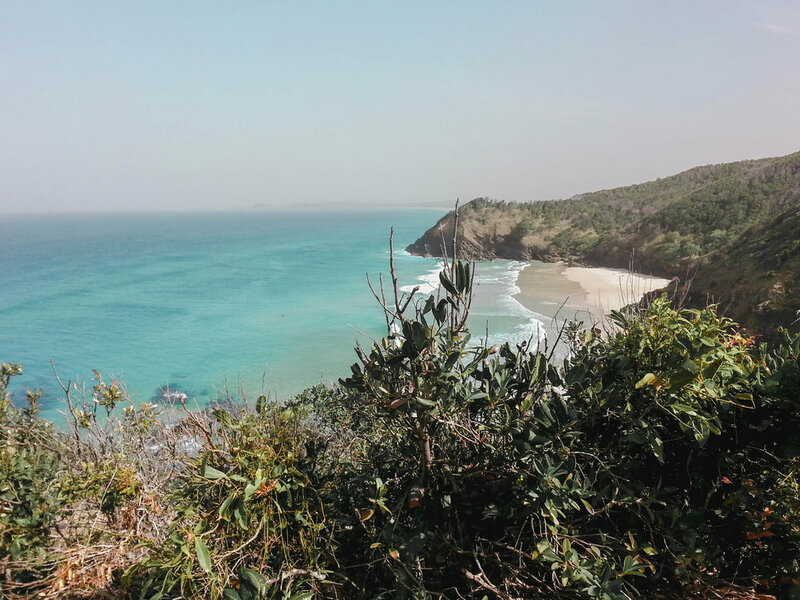 Byron Bay is the easternmost point of Australia, jutting out into the Pacific Ocean. This provides a perfect vantage point from which to watch humpback whales as they make their annual migration from the Antarctic to warmer waters where they breed and give birth. Once they have mated or given birth, the whales head back toward Antarctica for the summer feeding. The migration takes place between May and November, so travel to Byron Bay in these times is likely to yield a sighting. We find that if we go in early September or earlier, as with this last trip, viewings are sparse. When we went in mid-September we saw up to four whales playing in the bay. Another year we visited in late September/early October and sightings were plentiful – and we got to see a mother humpback and her calf! Depending on where you go, you’re likely to see more than just whales. Byron Bay is rich with native wildlife. 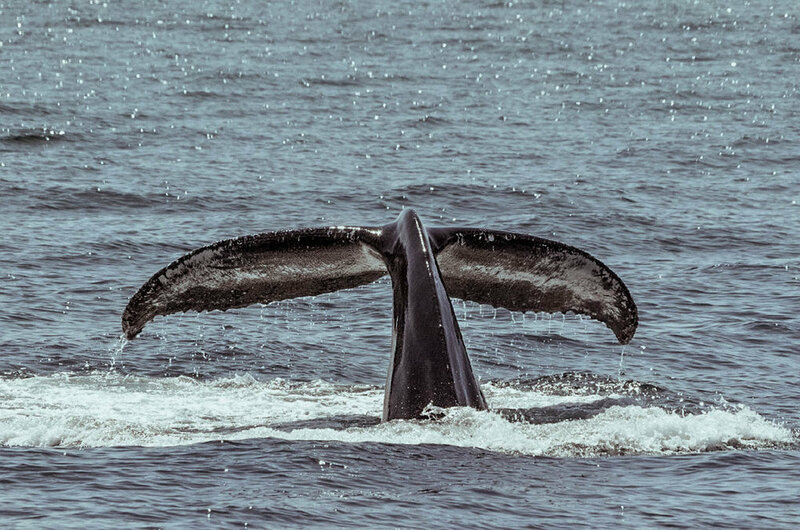 Whether or not you’re lucky enough to spot a whale, there’s a very good chance you’ll get to see a variety of marine creatures. From the Byron Bay Lighthouse we’ve seen sea turtles and sharks as well as humpback whales. From Broken Head we’ve seen lots of sea eagles, and a pod of dolphins close to the headland put on a spectacular show for us. 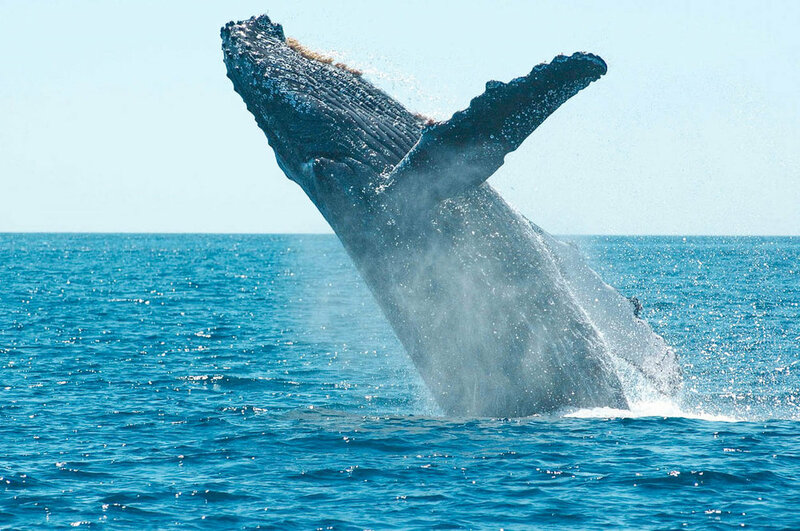 As for the whales themselves, the type of whale you’re most likely to see is a humpback whale. These magnificent gentle giants reach up to 18 m long (about the size of a very large school bus) and weigh up to 50 tonnes. And they’re not even the biggest species of whale (that title is taken by the blue whale, which at 30 m long is the largest creature on the planet). Their flippers can grow as long as 5 m and their tails can be up to 1.8 m wide. Humpback whales are black on the upper side and mottled black and white on their underside, with ventral pleats running from their lower jaw to their belly. On their back is their fin, which is usually what you’ll see protruding from the water when they surface. They usually travel alone or in small groups known as pods, which consist of two or three whales. Humpbacks migrate farther than any other creature on the planet, travelling a distance of 3000 miles (or 5000 km) during a migration. When I was a little girl, I dreamed and dreamed of seeing a whale with my own two eyes. It was all I could think about. Every time my parents took me to the beach my eyes would relentlessly scan the horizon. I’d hoped so desperately to spot one, but I never did. Then when Greg took me to Byron Bay, and we saw plenty playing in the bay, I started learning what to look for. I became so good at spotting them that on our family holiday last year, I became the official “whale spotter”. It seemed like every time I looked out over the beach I glimpsed one jumping from the water. Now this is probably just sheer luck, but I like to think I’ve gotten better at spotting whales over time. I’ve learned a thing or two about what to look for. Sometimes, the whales are quite far out to sea. Although you can still get a good enough glimpse of them to be spellbound, they’re easy to miss if you don’t know what you’re looking for. The best time (I’ve found) for spotting whales in northern New South Wales is mid to late September/early October. Definitely take some binoculars, but don’t live inside them. Days when the water is calm are the best for whale spotting. Too much chop in the water is easy to mistake for the wake of a whale surfacing, and vice versa. Scan the ocean from left to right, moving your eyes slowly, and then back from right to left. Keep a good sense of awareness, both direct and peripheral as you look. Scan the horizon and then pull your gaze forward toward the beach. Look for spouts or blows. Remember, whales are air breathing mammals and need to come up for oxygen. When they do, they’ll exhale a large plume of air, water vapor and mucous from their blowhole which will shoot into the air. If you see a fine spray of mist come up from the surface of the water, keep your eyes peeled close by. You’ve likely just seen your first whale! If you see a boat stopped, keep your gaze in that area. It could be a whale watching vessel – and they’ll usually go where the whales are. Once you’ve spotted a whale, keep your eyes fixed in that general area. Whales can dive for up to 10 minutes, sometimes longer, before they need to resurface for air. If you keep your gaze focused in the general direction of your first sighting, you’ll likely see it again. How do you know there’s a whale around? Look for their footprints. Yes, footprints! If you’ve got a good viewpoint and you are looking out over the surface of the water, keep your eye out for “footprints”. These are circular “flat” calm patches in the water left by whales when they flick their tails. You can even see these if the whale doesn’t surface. When I spot them, I keep my eye on that area and I’m almost certain to see a whale soon afterward. Watching whales move through the water is a mesmerising experience. They have a peace and grace about them, even for their sheer size, that is truly life changing to witness with your own eyes. If you want to look like an expert whale watcher, here are a few whale watching terms to describe the behavior you may observe. Lobtailing: The whale lifts his flukes out of the water and then brings them down onto the surface rapidly, making a loud “slapping” noise and sometimes a great splash. Scientists don’t exactly understand why whales do this. Various theories postulate that it is to scare fish, communicate with nearby whales or as a sign of aggression. Spy Hopping: The whale lifts her great head and even part of her chest out of the water so that her eyes are just above the water line and she can get a good look around. Pectoral Slap: The whale slaps a pectoral fin onto the surface of the water. Tail Throw: This is different to lobtailing. A tail throw is a violent action. The whale aggressively throws its tail and the rear part of his torso (the peduncle) out of the water and slaps them back down onto the water’s surface with an almighty force. This occurs often in mating season and is thought to be as part of competition with a rival mate. Breaching: The Main Act, this is what anybody who is whale spotting hopes to see. The whale leaps from the water with great force, throwing more than 40% of her body above the surface of the water and descending again with a splash. As with lobtailing, scientists aren’t exactly sure why whales do this. They speculate that it could be to stun prey, communicate with nearby whales, dislodge parasites from their skin or simply for fun. Byron Bay is a prominent whale watching destination in Australia. Maybe the whales love the earthy, chill beach side vibes as much as us humans do! 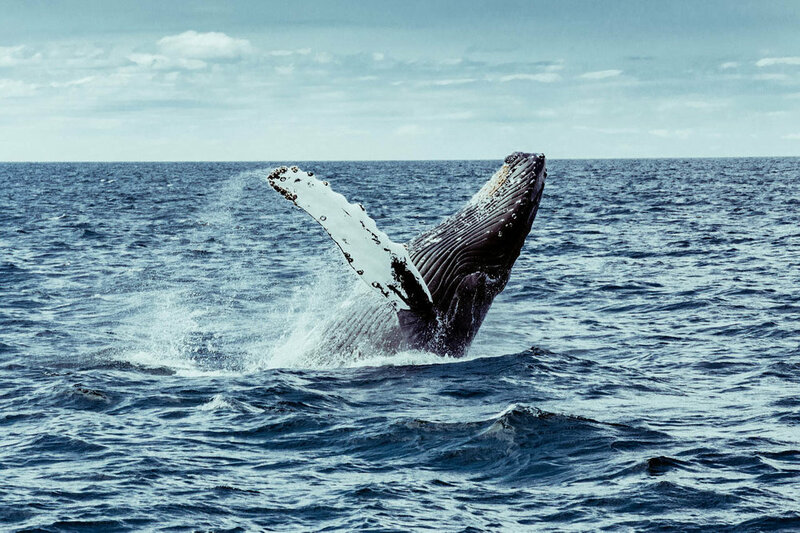 Whilst you could probably even spot a whale whilst sinking a cold beer at The Beach Hotel in town, we do have a few favorite top spots to catch a glimpse of whales and other wildlife from the shore. 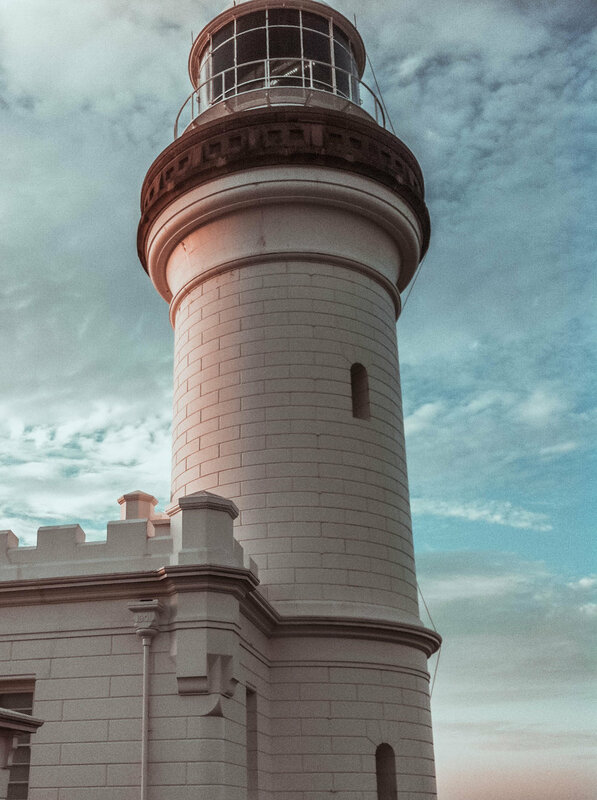 The fact that this lighthouse sits perched atop the easternmost point in Australia makes it reason enough to visit, even without factoring in that it’s a great spot to see humpback whales and other marine wildlife. The lighthouse is still in operation and is in fact Australia’s most powerful lighthouse. It’s located about 2 km northeast of Byron Bay. 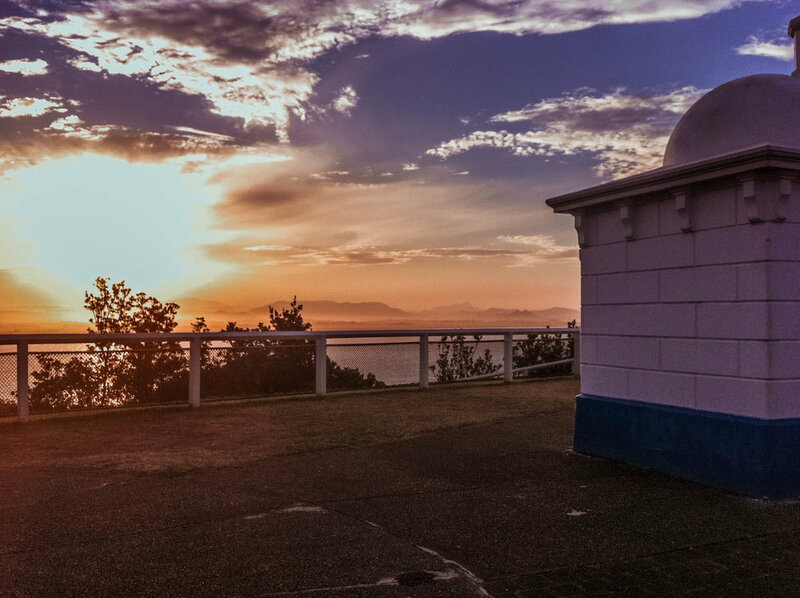 Whilst parking is available onsite, Cape Byron Lighthouse is extremely popular with tourists and parking spots are a rare thing to come across! Take a good pair of walking shoes, in case you have to park further downhill and walk up the hill to the top. 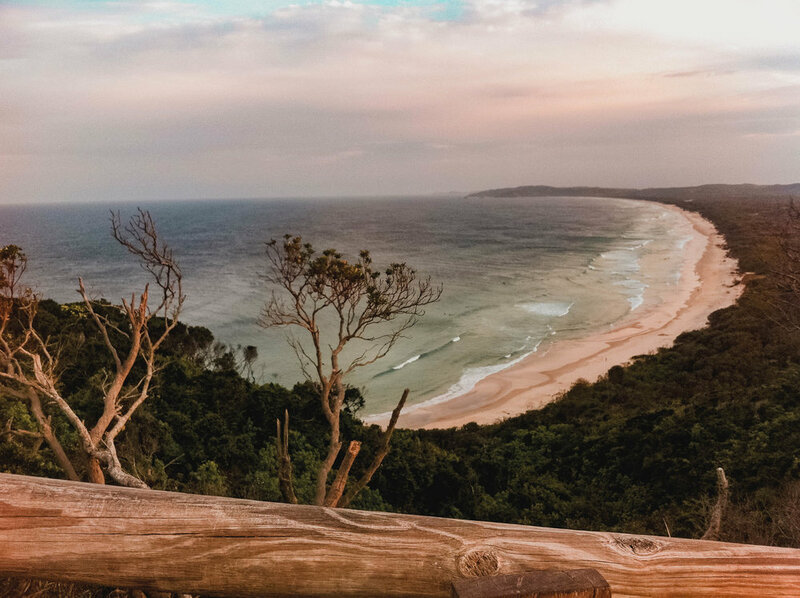 With spectacular views of the ocean from up high, Cape Byron is a fantastic spot to watch the whales. You can often see whale watching boats paddling along in the water below. Make sure to keep your eyes on them, as they’re likely following the whales. 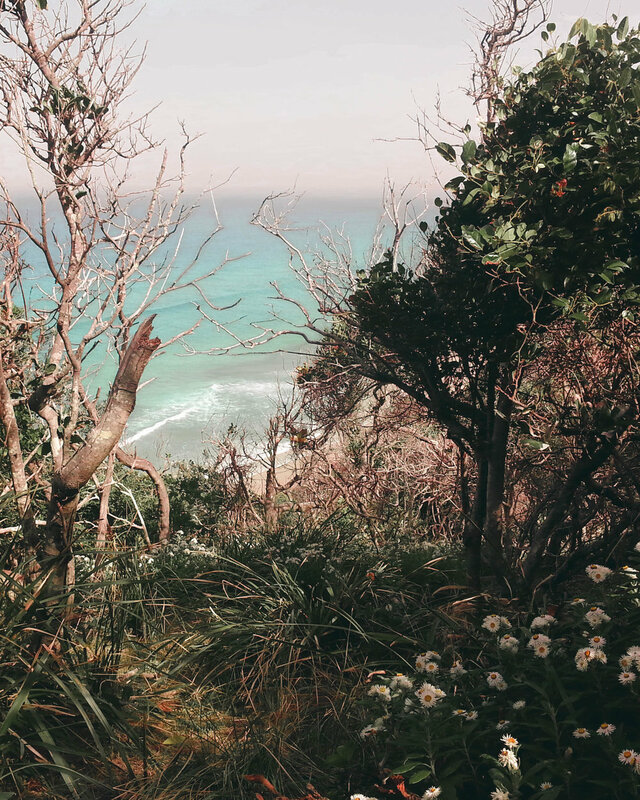 If you’re keen for some exercise, walk to the very easternmost tip of the continent along the Cape Byron walking track. From there you will get a closer look at the whales as they swim near the shore. When we first visited the headland over Whites Beach six years ago, on our second date, we were alone. Parking in a secluded spot, Greg led me into rain forest. A roughly eked out dirt path led us down a steep hill, navigating stones and tree roots through dense green undergrowth and wildflowers. Slowly, the canopy of trees overhead grew sparse, allowing glimpses of the brightest blue ocean I had ever seen, and of glorious Whites Beach. We picnicked on the headland overlooking Whites Beach with a bottle of wine and some hot chook sandwiches and watched the whales play in the bay all afternoon. We had the whole entire place to ourselves. It was very romantic and secluded. It felt like our little secret. Then the Australian Traveller listed Whites Beach as the best kept travel secret in Australia so now... it, err... isn’t so secret. You’ll very likely awkwardly bump shoulders with at least one other person on your way through rain forest along the narrow track, and can abandon any notion of seclusion you might once have had. When we visited Whites Beach just recently, in fact, we were lucky enough to jag a spot right on top of the headland overlooking Whites Beach. I fear we may have spoiled the day of another visitor who had to her mind planned to sit in just that spot. Upon emerging from the rain forest with her esky and beach chair and seeing us, she groaned – very loudly – ‘oh, for f**k’s sake!’ and stormed off to find another, more secluded spot. The secret place where the whales are is no longer secret and the cat’s well and truly out of the bag so we figured we might as well tell you about it. It’s a fantastic spot for watching whales, and still less packed with tourists than Cape Byron Lighthouse. This owes mostly, I would surmise, to the fact that the walking track to get there requires a moderate level of fitness and walking ability. From that point atop the headland, you feel as if you are on top of the very world – and it’s quite a view from up there. When I’m standing there I always feel an overwhelming sense of peace, relaxation and coming home. 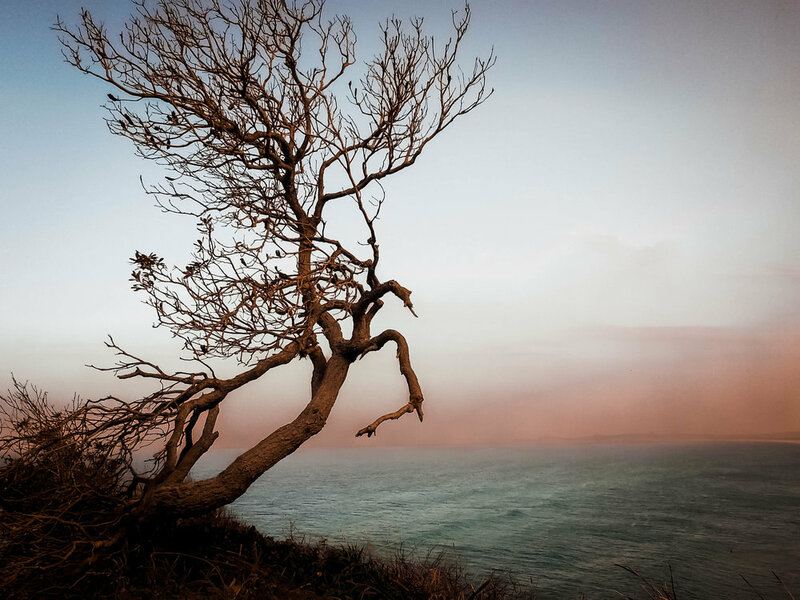 Whites Beach is exceptionally beautiful, wild and untouched and that’s what makes it so special. Bear this in mind when you visit and remember to take your rubbish with you and stick to the already-worn tracks. Oh – and one more thing. During whale season, it can get mighty windy up on that headland, so be sure to take a warm jacket. 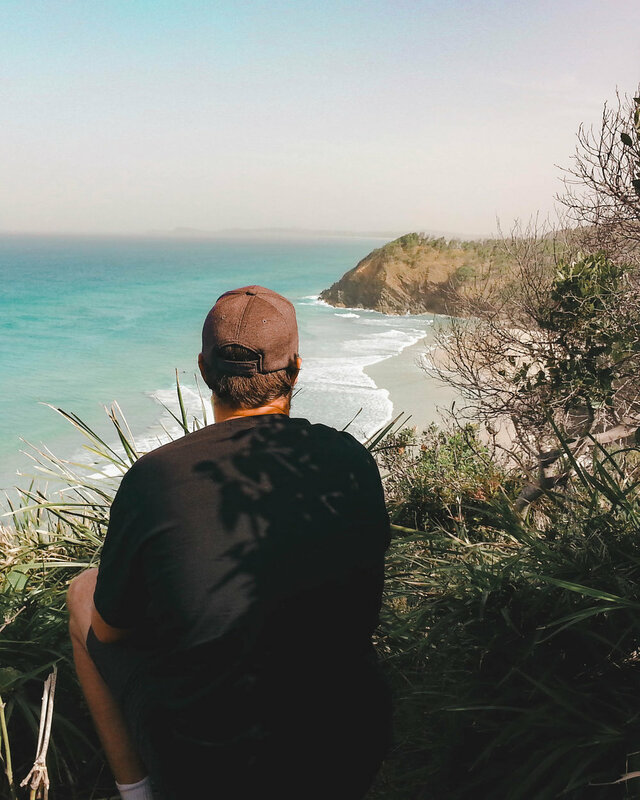 Even in the six short years that I have been a regular visitor to Byron Bay, its popularity with tourists has grown, making it a busy place to visit any time of the year. But it retains a chilled, earthy Zen vibe that has me coming back time and again. And as a destination for whale watching from the comfort of dry land, for those like me who have yet to get their “sea legs”, it simply cannot be beat. With a few whale spotting tips, a trip at the right time of year and a bit of luck, you’re bound to glimpse a whale (or three) while you’re soaking up the sun, surf and good vibes.